This major retrospective exhibition—the first in the United States in more than 35 years and the most comprehensive ever mounted—showcases the pioneering work of Italian artist Alberto Burri (1915–1995). Exploring the beauty and complexity of Burri’s process-based works, the exhibition positions the artist as a central and singular protagonist of post–World War II art. Burri is best known for his series of Sacchi (sacks) made of stitched and patched remnants of torn burlap bags, often combined with fragments of discarded clothing. Far less familiar to American audiences are his other series, which this exhibition represents in depth: Catrami (tars), Muffe (molds), Gobbi (hunchbacks), Bianchi (whites), Legni (woods), Ferri (irons), Combustioni plastiche (plastic combustions), Cretti, and Cellotex works. 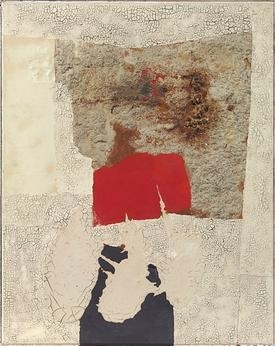 Burri’s work both demolished and reconfigured the Western pictorial tradition, while reconceptualizing modernist collage. Using unconventional materials, he moved beyond the painted surfaces and mark making of American Abstract Expressionism and European Art Informel. Burri’s unprecedented approaches to manipulating humble substances—and his abject picture-objects—also profoundly influenced Arte Povera, Neo-Dada, and Process art. Alberto Burri: The Trauma of Painting is organized by Emily Braun, Guest Curator, and Distinguished Professor, Hunter College and the Graduate Center, City University of New York, with Megan Fontanella, Associate Curator, Collections and Provenance, and Ylinka Barotto, Curatorial Assistant, Solomon R. Guggenheim Museum. An accompanying study was led by Carol Stringari, Deputy Director and Chief Conservator, Solomon R. Guggenheim Foundation. The Guggenheim Museum is also grateful for the collaboration of the Fondazione Palazzo Albizzini Collezione Burri, Città di Castello, Italy.